Dan’s front-end-of-innovation work with DuPont (as a lead client) led to a novel online training model, that received the “best article of the year” award from the Product Development and Management Association. 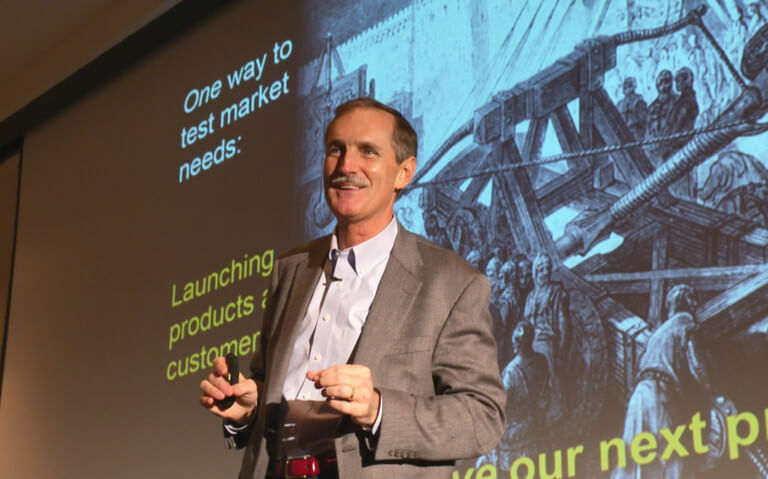 One of the foremost experts in B2B innovation, he has taught thousands of B2B professionals in every region of the world in hundreds of workshops—logging up to a quarter-million miles annually. 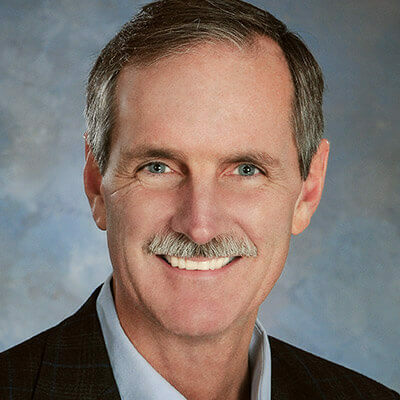 An award-winning speaker, he has lectured at Wharton’s Executive MBA program and other American & European universities, and is a popular industry keynote speaker. Dan logs up to a quarter-million miles annually speaking to groups around the world. He is a frequent keynote speaker at major trade association events, where he inspires B2B innovation and sustainable, organic growth. 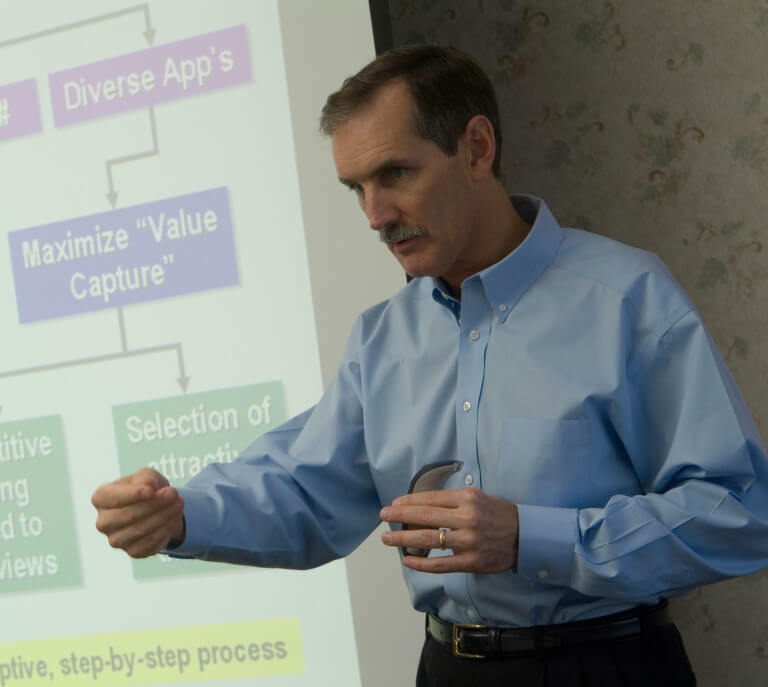 Since 2005, he has taught thousands of B2B professionals in hundreds of in-depth workshops. Download his speaker kit. Dan and the AIM Institute training team know you don’t develop leading innovation practices from an armchair. Each year, he trains hundreds of global marketing, technical and sales professionals in every conceivable B2B industry. (70+% of this work is with Fortune 500 level companies.) 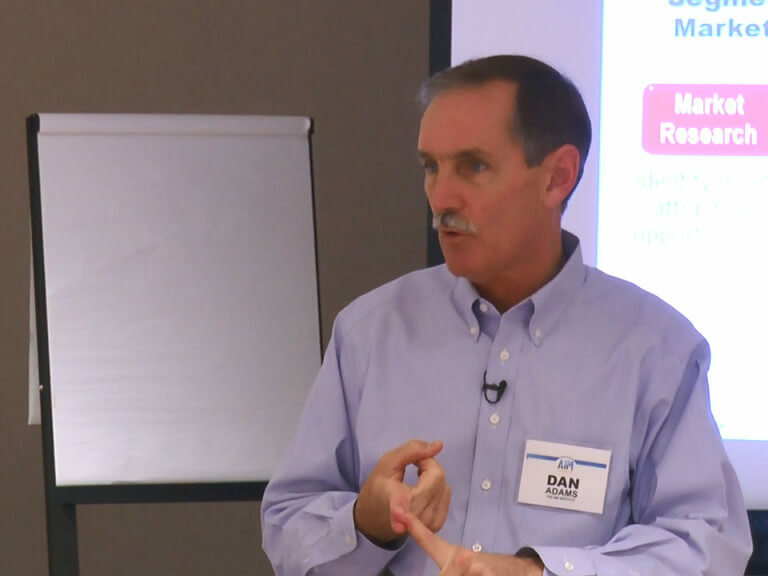 Dan uses these in-depth workshops and 100+ annual coaching web-conferences to continue refining his methods… as project teams apply them in the crucible of real-world practice. Dan and The AIM Institute training team don’t believe in “parachute workshops”… where the instructor “drops in” and wishes good luck at the end. Rather, AIM training blends several learning approaches over many months, as real teams advance their projects. Learn more about AIM’s training in the front-end of B2B innovation, New Product Blueprinting, dynamic B2B product launch, LaunchStar, and high-stakes project De-risking. Want to offer an exciting, thought-provoking webcast to the members of your trade association or organization? Dan is a seasoned pro, with a broad range of topics, high-impact graphics, a fun, friendly delivery, and engaging Q&A at the end. To discuss the possibilities, Contact the AIM office. Isn’t it gratifying when you help your readers, audience, or colleagues stop and think in new ways? Perhaps these original quotes by Dan can help you “move minds.” Please give attribution to Dan’s main quotes below (in quotation marks). The text in grey is provided for context. My first rule of battles is… you can’t win one you don’t know you are in. All great customer interviews are alike. Every unhappy interview is unhappy in its own way. If you like confirmation bias, you’ll love ‘validating hypotheses’. Maximize shareholder value’ is the pledge of allegiance recited in board rooms. It is a poor goal. When analytical and discovery thinking compete in new product development, expect the former to dominate. More companies rely on ‘voice of ourselves’ (VOO) than ‘voice of the customer’ (VOC). Closely examine B2B innovation malpractice, and you’ll see a pervasive disregard for customer needs. You should interview B2B customers in a way that allows—even invites—surprise. When developing new products, you simply don’t know what you don’t know. Your new product development process is probably backwards. Asking an executive to focus on maximizing shareholder value can have troubling consequences. Let’s stop testing B2B market needs by launching products at customers.